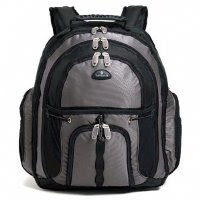 Backpacks can provide plenty of storage space for you, and they use adjustable shoulder straps to ensure a secure, bounce-free way to carry your laptop. 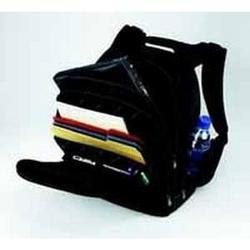 A laptop backpack includes a laptop sleeve that is especially good to have, as it will increase the safety and security of your unit. The Bumbakpak Streetflow Collection is innovative and is up to the task for those of us who need to have something to carry our laptops for any length of time and over any distance. For the corporate environment, the Case Logic CNB-1 Laptop Backpack has ergonomically-designed shoulder straps as well as a cool, mesh back padding for comfort. With lots of storage and a removable mesh pocket for all of your mobile accessories, it is very functional. 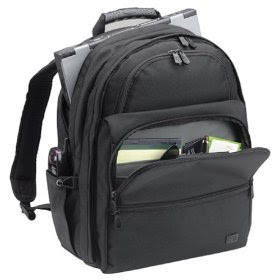 For your 15-inch laptop, the eTech Explorer Laptop Backpack is made of cross-lock ballistic nylon along with shoulder straps that are filled with foam for your carrying comfort. 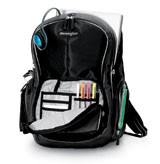 Another excellent backpack is the Samsonite Computer Sport Backpack, complete with padded computer section, it protects your laptop from shock when you’re traveling. With plenty of storage for your mobile gear, its shoulder straps have nonslip pads to prevent the backpack from sliding when you carry it. Instead of opening across the top, it opens down the middle to provide quick access to your laptop. It also has a removable cell phone pocket, which is in the shoulder strap for easier access. Complete with two large external pockets for access, it allows convenient access to documents and has multiple interior pockets for other mobile accessories. The Kensington Saddlebag Sport is more for the casual looking, backpack person and is excellent for carrying your notebook in. Complete with ergonomically design side panels, it brings the weight of the backpack to your center of gravity, which makes it easier to carry anything long distances. You can carry laptops that are from 15 inches to 17 inches, and it also has quick access side pockets. 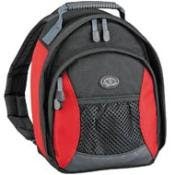 If you’re looking for a backpack that holds laptops up to 16 inches, have a look at the Fellowes Body Glove Backpack-Fast Track. It comes complete with a poly-armor padded section to keep your laptop secure. It also has a hidden pocket in a separate “dividers” section to keep files in order. It weighs only 2.4 pounds. If you sometimes feel like a beast of burden, the Kensington Contour Laptop Backpack has a contoured, adjustable, lumbar support panel, which will shift the weight onto your hips to reduce fatigue. And finally, the Tamrac Women’s Slim Laptop Backpack is designed for women. It is sleek and slim, provides plenty of storage space for all of your mobile gear, and gives your laptop good protection, too. 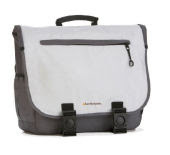 Complete with foam-padded shoulder straps that slide to cushion the load, it has a main storage area for files and your computer, as well as an external front pocket for all of your mobile accessories.